Twelve 2" metal D-ring tie pts. 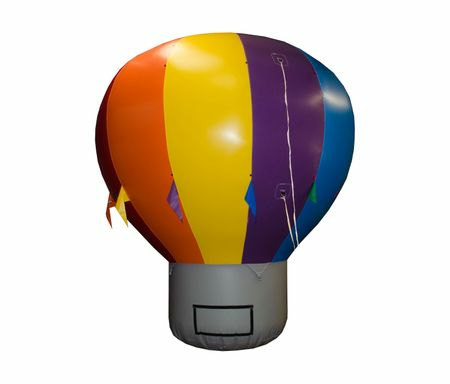 All of our rooftop hot air shaped balloons are made of high commerical, UV covered leasing grade 7.5 oz. nylon. Tops and foundations are made of 18 oz. vinyl. Deflation flaps, 12 welded metal D-rings for tie-down anchors. Balloon is sewn with machines that stitch twice: envelope is stitched twice and afterwards, top stitched by a two-needle machine (4 stitches per seam). All balloons are equipped for light equipment.